Honda’s Project Drive-In : Starlite Drive-In – aRowe Films and Ent. Honda Motors has spearheaded a campaign to help save a slice of Americana. 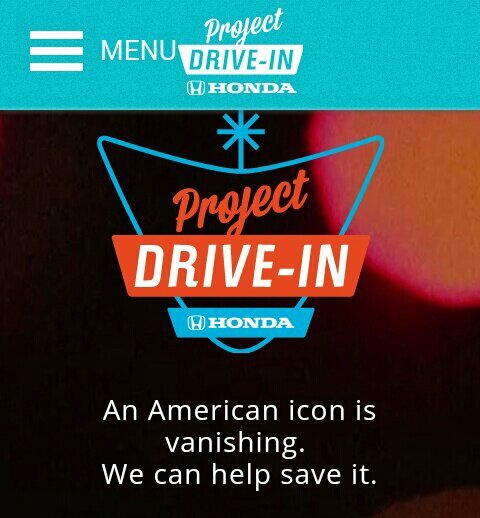 With Project Drive In aka #SaveTheDriveIn, Honda committed itself to bringing awareness to the movie motion pictures conversion to the digital format from film. Because of this many of the nations Drive -in theaters were facing closure by the end 2013. Honda, through a crowd funding movement would donate digital projectors to drive-in theaters across the nation that had not already made the costly conversion. Starlite Drive-In’s owner Jim Goble in conjunction with aRowe Films decided to join in bringing awareness to this problem by creating a video piece.